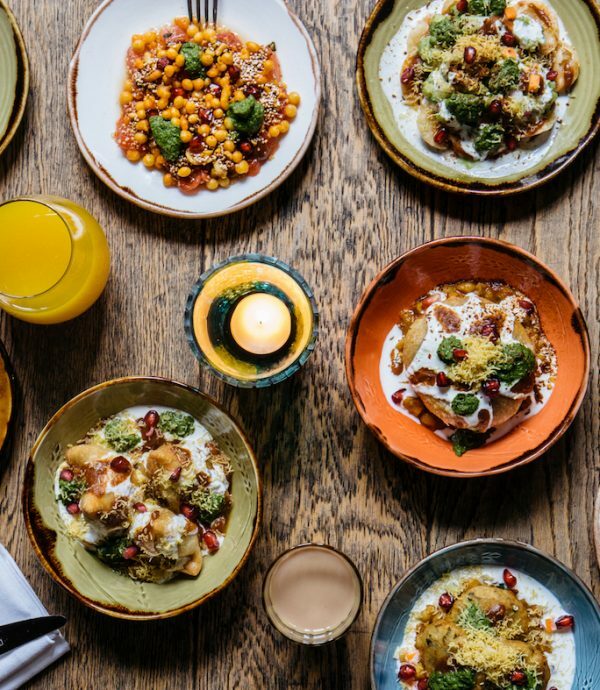 Cinnamon Bazaar is the new opening of the Cinnamon Collection – the Indian restaurant group headed up by chef Vivek Singh. 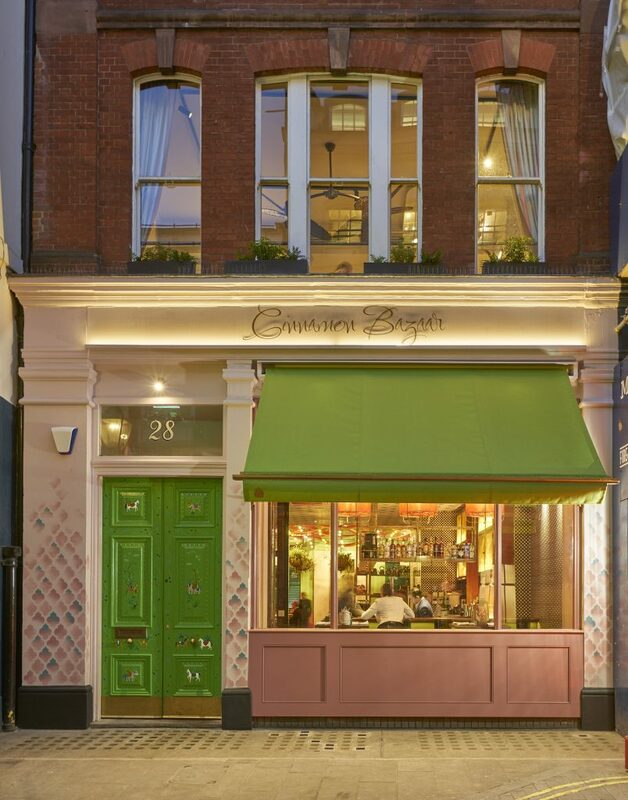 Based in Covent Garden, just a stone’s throw from Charing Cross Station, this two storey site serves breakfast, lunch, and dinner, along with cocktails and light snacks. 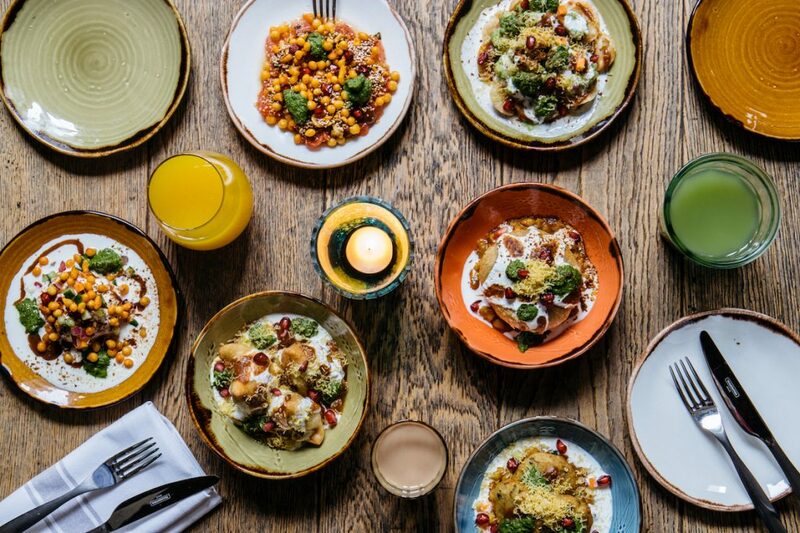 The Cinnamon Collection group, which includes the Michelin-starred Cinnamon Club, has a stellar reputation for high quality ingredients and bold, authentic, Indian flavours – and Cinnamon Bazaar is a welcome addition to the group. 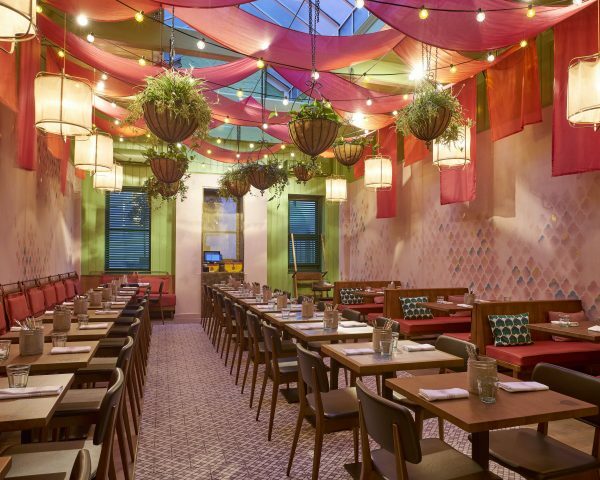 This sister branch brings a more casual and relaxed vibe to the group, inspired by the vibrant, colourful markets of India where bazaars scattered on the ancient Silk Route brought a fun exchange of delicious ingredients and creative ideas. This idea translates wonderfully into the venue. This is a warm, cosy interior of a glowing souk with rose gold walls, rich pink silk awnings and drapes of flowers gracing the ceiling. 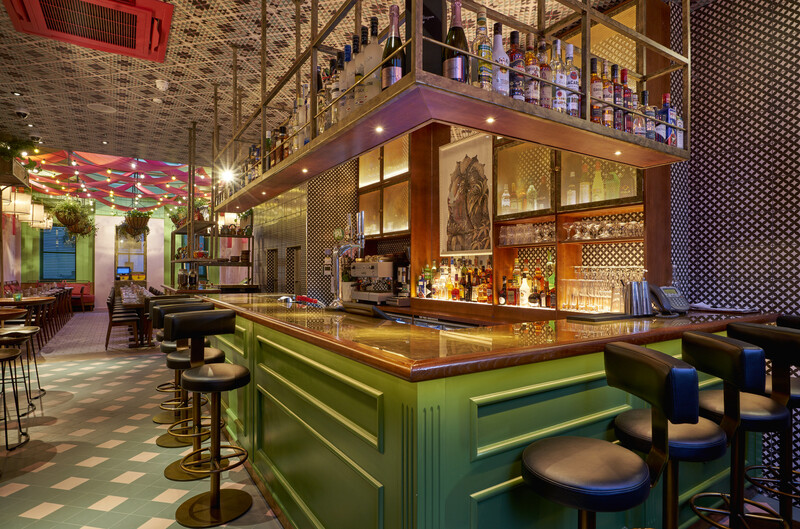 The bar is small and intimate with a small but select choice of Indian inspired cocktails, whilst the restaurant itself presents wooden tables and seating close together for a warm, casual feel. This is the place for after-work drinks, light snacks, and dinners with loved ones – as well as a more chilled, escapist business lunch. 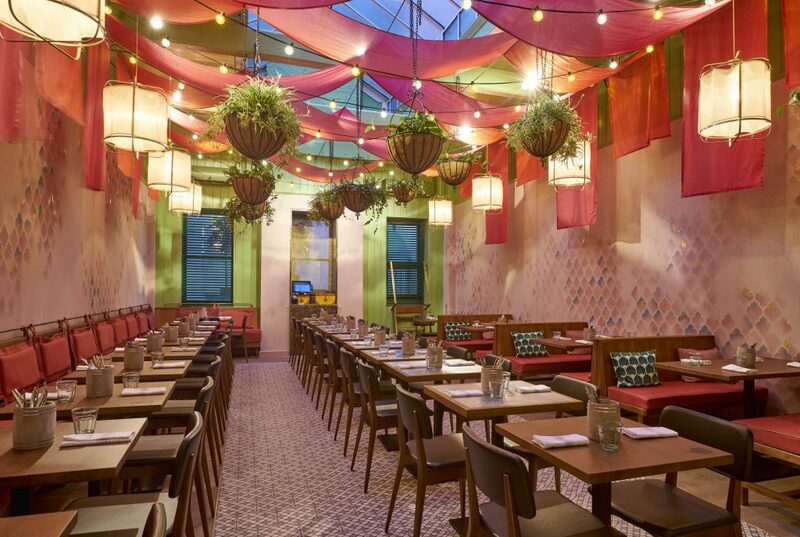 The menu is an interesting fusion of East and West, with a range of snacks (described as light bites to enjoy with a drink or two), chaats (slightly more substantial light bites, typical of Indian street cuisine), bazaar plates (mains), and delicious sides. Our kind and hospitable host passionately recommended starting with two of the snacks as we enjoyed our first drinks of the evening. We began with two cocktails, the Falooda Swizzle, a perfectly balanced, rum based drink, with the surprising addition of amaranth cress. 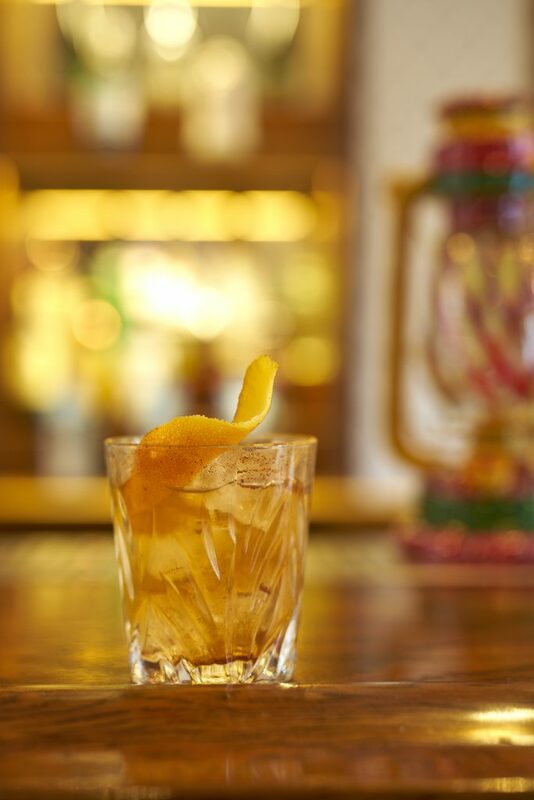 This was our first exposure to the unusual way that Cinnamon Bazaar plays with textures to add an element of surprise. 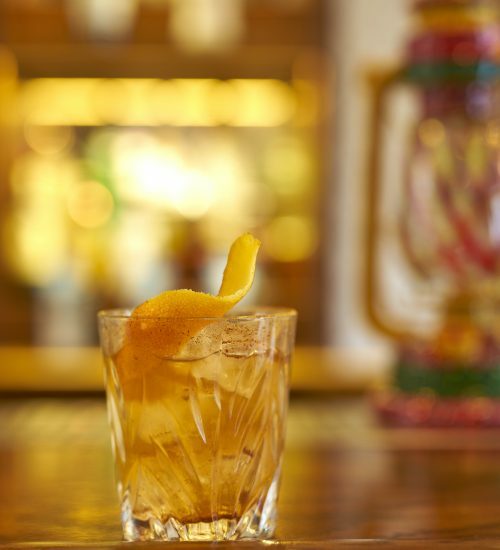 We also decided to sample their twist on an Old Fashioned, the Bazaar Old Fashioned, which incorporated notes of coconut and cinnamon to the scotch for a more eastern flavour. Though we had our cocktails as an aperitif, they would have paired fantastically well with the food in place of the wine. For the snacks, we went for the Chana masala hummus with fenugreek scented nimki and the Crab bonda: Calcutta spiced crab and beetroot in chickpea batter. The hummus was delicious and full of interesting spices – a different class completely to your average hummus and well worth exploring, whilst the nimki – little, deep fried slices of pastry to dip with, were deliciously crispy, light, and aromatic. The crab bonda was excellent. Redolent of falafel in appearance, these were rich balls of spiced crab meat with juicy beetroot, crispy with the chickpea batter but warm and moreish on the inside. Portions were decent for a snack and two or three with a drink would make a sufficient light appetiser when out with friends. Well worth trying. 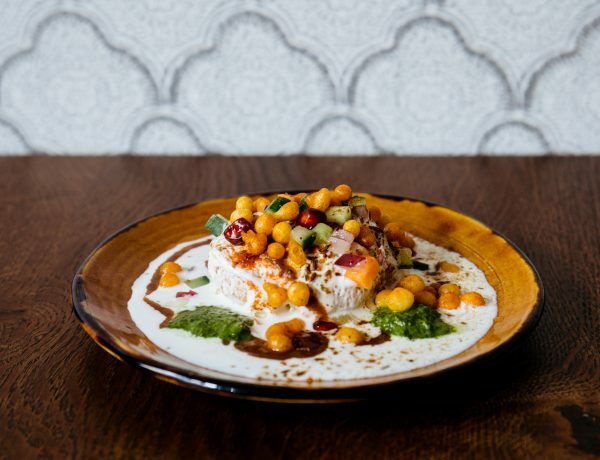 For the Chaats, we were recommended the Dahi bhalla chaat: chilled lentil dumplings with spiced yoghurt and toasted cumin, Jodphuri kachori chaat: spiced onion dumplings with curried white peas, and chutney medley, and the Papdi chaat: Crispy wheat, tangy tamarind, yoghurt and chickpea vermicelli. The Chaat course was fantastic and arguably the highlight of the evening. An innovative and unexpected introduction to traditional, Indian snacks found in a bazaar, this was a game changer to me of how flavoursome and fun Indian food can be. There are 6 chaats on the menu and both my guest and I intend to return to sample the other three. 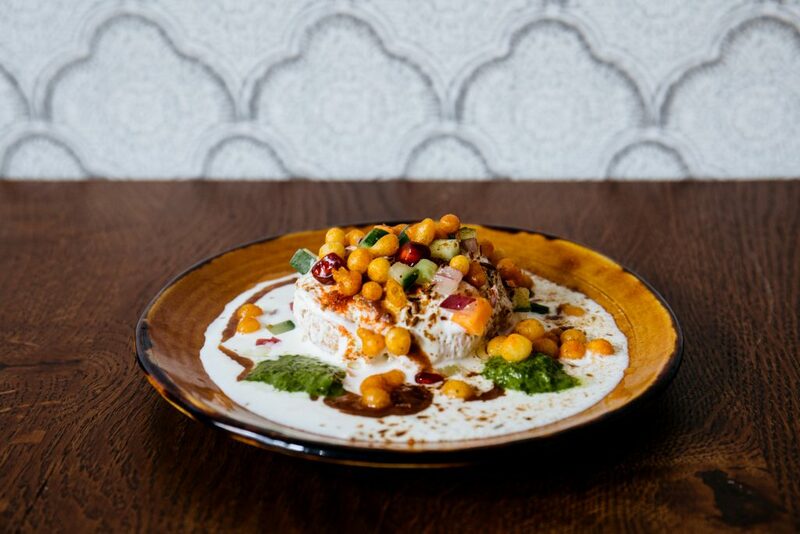 My favourite, was the papdi chaat which featured delicious, small, triangles of crispy wheat in a pool of thick, creamy yoghurt and topped with flavoursome, nutty strands of deep-fried chickpeas and topped with a mysterious and ever-so-delicious green chutney of coriander and spices. Incredibly more-ish, a portion for one person would be ideal as it felt too good to share. The jodphuri kachori chaat – the spiced onion dumplings, were equally (if not more?) delicious. This was a large dumpling, redolent of a soft and fluffy dim sum bun, filled with spicy, sweet and salty onion, stewed delicately in a curry like sauce with white peas and topped off with more of that delicious coriander chutney. Meanwhile the dahi bhalla chaat – the chilled lentil dumplings, took both my guest and myself by surprise, as a cold, white, almost savoury dessert like texture of lentils topped with spiced creamy yoghurt and flakes of crispy toasted cumin. All were delicious and at an average of £5 per dish, seem like excellent value for the taste buds. We asked our host to suggest our mains as it was impossible to decide from the comprehensive menu. He selected a number of his favourite ‘Bazaar plates’, all more delicious than the last. The Tandoori Kentish lamb with mint chilli, masala cashew nut was tender, fragrant and delicately spiced. The fusion of British lamb with Indian flavours worked brilliantly and highlighted the exceptional quality of the meat. Next up in our culinary tour, was the grilled aubergine. 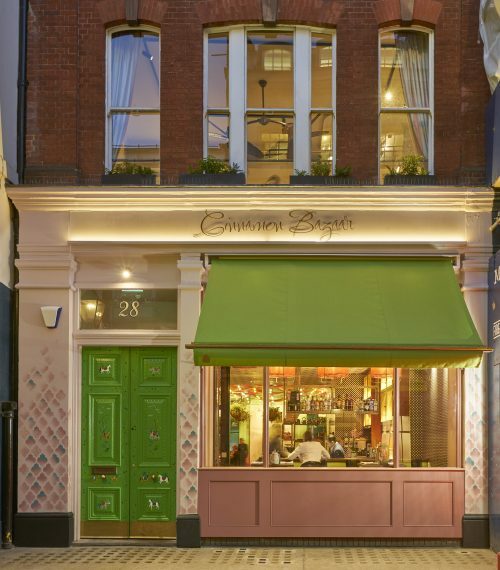 Aubergine seems to be having a moment in the London restaurant scene and Cinnamon Bazaar’s interpretation was a serious contender, and would have satisfied even the most hardened carnivore. Perfectly cooked, the addition of sesame peanut crumble and toasted buckwheat brought another dimension to the dish. However, the dish that I’m already dreaming about returning for was the double cooked pork belly ‘Koorg’ style with curried yoghurt – it was succulent, tender and, like all the other dishes we sampled, thoughtfully spiced. We greedily ordered both naan and peshwari naan – hands down the best I have ever tried. Our stir-fried bok choi with garlic and cumin were our nod to our five a day. Throughout these two courses, we enjoyed a Slovenian Malvasia – a 2014 Malvazija Gasper, Goriska Brda. The Malvazija is the same grape variety as Malvasia Istriana, which is indigenous to the Croatian and Slovenian coastal areas that used to belong to Italy. Redolent of all that wonderful Italian wines have to offer, but more sun-kissed with golden yellow and intense, tropical aromas and rich notes of nutty almonds, this is a zesty, vibrant wine with an indulgent honey depth to it that stands up to the strong Indian spices of the dishes, yet complements and softens them with its creamy, nutty finish. The wine list more broadly, features similarly interesting wines all of which are chosen well to match what is otherwise a notoriously difficult cuisine to pair with. Despite having been fed exceptionally well, we were persuaded to try a couple of desserts. Kulfi is always the perfect end to an Indian meal, and the unusual flavour of kubeb pepper made for a less sweet treat. The crème brulee was a blend of the typical French dessert and Kheer, an Indian rice pudding flavoured with cardamom. We shared the two between us, washed down with a couple of glasses of Innocent Bystander, a 2015 Moscato from Australia. A floral pink frothing wine which paired perfectly with the Indian spices in our sweets. A wonderful conclusion to a perfectly balanced meal.